Time flies when you’re having fun… and when you’re exhausted! It’s been a bit of a challenge transitioning from student life to being at the hospital. 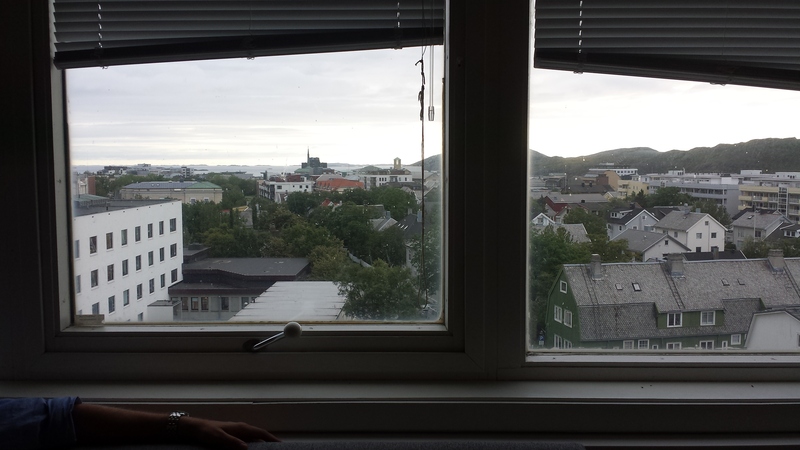 Sometimes during our time off, I’ll catch Skjalg just staring out the window with his hands in his pockets. After 5 minutes or so, he always turns around and says, “It’s so weird having free time”. Last I wrote, I had just experienced something that I will remember forever: my first ever patient! I do want to clarify that this is not the first patient I’ve seen as a medical student, just the first one for whom I was responsible (at least for the physical evaluation, history and admittance paperwork). Our first clinical class is internal medicine, of which we have completed 2 of 5 semesters. During the first semester, we visited the hospital twice a week and learned how to properly examine patients and take a patient history. This continued into the second semester, but we only had “class” once a week and three of the sessions were seminars covering endocrinological diseases. In internal medicine, we are assigned to a patient as a pair, one with whom our doctor is already familiar, and afterwards we present our findings. Since it is a teaching hospital, the patients are quite used to students examining them and are fully aware that the examination is practice. The experience last Wednesday was different because the patient was essentially my patient. So, jumping back to last Wednesday. All I knew in the hour before was that I would be getting a patient with erysipelas, that he/she spoke English and that the resident would be there to help me if I needed it. I didn’t really know what to expect or what I would have to do, so I didn’t prepare anything. I simply followed the resident while she checked in with her patients and when I was alone, I browsed through some physical exam techniques. Suddenly, it was time. A few long, quick steps brought us over to a separate area of the emergency room with two doors. A nurse was there dressing himself in a yellow gown and putting on a mask and gloves. As he snuck into the room, it hit me: the patient was in isolation. All of a sudden, things became really fast paced. The resident told me that I would be going in alone and that, in addition to doing the full physical and history, I had to take samples for MRSA (a highly resistant bacteria that is strictly monitored in Norway and many other countries). It really wasn’t a big deal in the end, and definitely not complicated, but this was my first time and I had to do it sterile! I had to wear a special sterile gown, mask and gloves, use a special stethoscope and couldn’t touch my notes or pens. It felt like I had to do everything without touching anything, or at least be extremely aware of every single movement I made. In those minutes outside the room while I was getting dressed, I felt like I was getting ready to jump out of a plane and the resident was telling me everything I needed to do to deploy my parachute and survive. A little dramatic, I know, but that is really what it felt like. Luckily, it usually doesn’t show when I am nervous. My confusion/anxiety somehow translates to confidence when I need it most. Fake it till you make it, right? When dealing with patients, there is so much to remember! You have to remember what questions to ask, in which order to ask them and how to ask them. You have to make sure you ask the right questions and there are so many questions you can’t forget to ask (i.e. do you have any chest/abdominal pain?). For the physical examination, you have to have a system. Otherwise, you’ll have the patient moving up and down, back and forth – and most likely wondering if you know what you’re doing! There are so many details you need to cover and it needs to be done in a timely manner – but must also be thorough and correct! And this all needs to be done in a way that still makes the patient feel comfortable, that makes them feel heard and their thoughts/feelings respected and that makes them feel like they are in good hands. All of this was swirling around in my head. Add on the fact that this was only my second day of practice – and in a foreign country! – and I had to remember to keep it sterile! I did everything I could to maintain a facade of confidence, competence and caring. That didn’t stop me from feeling like a little girl with no business being there… but no one – especially the patient – needed to know that. The MRSA samples had to be done right away. This was required for this patient, who we can call Rio, because Rio was a tourist and protocol dictates that they be screened. I had to take samples of Rio’s nose, pharynx (back of his/her throat) and lastly, perineum. For this one, I gave Rio the choice of either me or him/her doing it, for obvious reasons. After I’d collected the samples, I clicked the call button for the nurse and then met him outside to deliver them. I don’t think he ever picked up on the fact that I was just a medical student because at this moment and for the rest of the examination, he talked to me like I was a doctor. He asked me if I wanted to run an EKG and I told him that I wanted to wait until the resident came back to confirm whether or not that was necessary. Back in the room I jumped into my examination routine. For this part, I was so, so, so unbelievably happy that this was all in English! It was so nice to have one thing that I could be 100% confident about. Rio was patient (hehe) and cooperative, which was helpful when the resident finally came in and then suddenly left again – for an hour and a half. I’d finished with my examination, but had no idea what to do after. Since I didn’t know how long the resident would be, I just stayed there and tried not to touch anything. It was a bit uncomfortable keeping the conversation going for so long, but Rio was luckily enough pretty easy to talk to. Finally, the nurse came in with an infusion bag with penicillin and the resident swooped in to explain the treatment. I was buzzing quite a bit afterwards. I felt a little helpless and didn’t really know what to do with myself. The resident told me that I would need to write the admittance report – in Norwegian – and that gave me enough anxiety to keep my mind busy for the next 4 hours. Yes, 4 hours. It got so busy in the emergency room that I just stood around trying to not be in the way until finally, at around 18:00, the resident showed me to a room where I could sit down to write it. The hospital uses a program called DIPS for all patient information. Skjalg and I were both given usernames and passwords, but our access is limited (since we’re not doctors yet…). Without this access, I wasn’t able to do any of the things that she’d told me to do. I didn’t want to go back to the ER and bother her more than I already had, so I decided to write up everything in a Word file and then just transfer it over into her DIPS account when she got back. At this point, I had had no food or water since 6:30 in the morning and was feeling absolutely exhausted. When she came back, I was pleasantly surprised as she sat down next to me and read through the entire report, giving me feedback. It was such an important learning experience and I am so grateful that she took the time to help me. At 20:00, I was free. I made my way up to the medical student office, fueled by the thought of coming home to eat and crash. When I entered the office I heard Skjalg’s voice. 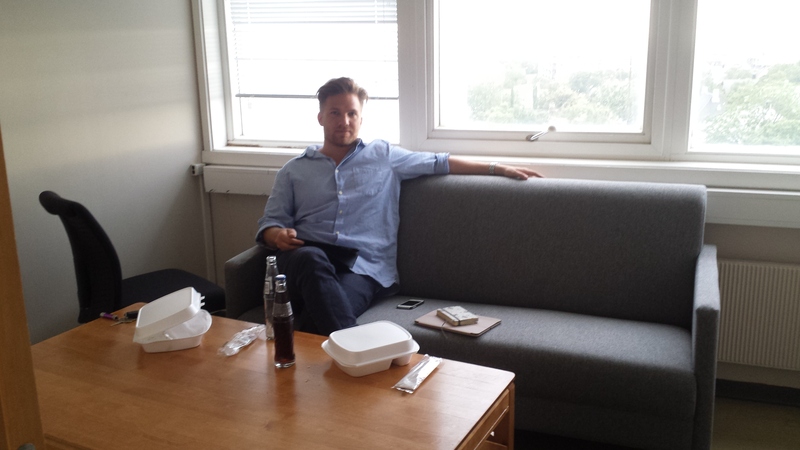 I peeked around the corner and there he was, sitting in the small meeting room with takeout from his dad’s restaurant. Fantastic job Bianca. We are all proud of you. Certainly I am! You have in fact just joined the society of physicians with a written history at least back to Hippocrates in ancient Greece. All that will be needed of you is to follow that oath honestly and faithfully, and do the best you can. Hey Bianca! Are you going to be in Budapest the 4th-7th of August. Will you be in town? You are currently reading My very own patient at Buda-B.